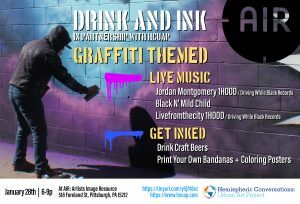 Public Debate: Should the City of Pittsburgh Have Legal Graffiti Walls? 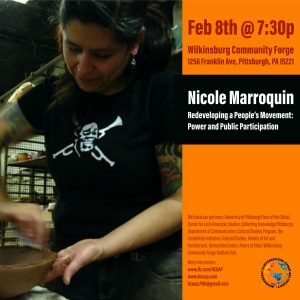 In part­ner­ship with the Univer­sity of Pittsburgh’s William Pitt Debate Union HCUAP has invited a panel that repre­sents the city’s Graf­fiti Squad, local graf­fiti and street artists, neigh­bor­hood council and graf­fiti watch members, and crim­i­nology and commu­ni­ca­tion scholars to offer reflec­tions on the possi­bility of creating legal graf­fiti walls. This serves as an oppor­tu­nity to put the public, govern­ment offi­cials, artists, and scholars in conver­sa­tion in public in ways they often are not to reflect collab­o­ra­tively on ways to build Pittsburgh’s capacity as a space of diver­sity, creative expres­sion, and vibrant dialogue. HCUAP seeks to create plat­forms for conver­sa­tion and educa­tion about urban art produc­tion (graf­fiti, street art, and muralism, among other genres), and to explore aesthetic and histor­ical connec­tions between the post-indus­trial cities of Pitts­burgh, Chicago, and León Guana­juato Mexico.